Maroon Bells Recreation Area near Aspen opens for the season on Tuesday. Aspen’s summer of outdoor fun is getting under way. The largest campground near town opens today, and the popular Maroon Bells Recreation Area will open Tuesday — a couple of days early. Maroon Creek Road will open at 9 a.m. Tuesday. At Maroon Lake, one bathroom will be open, but no drinking water will be available; visitors are advised to bring their own. 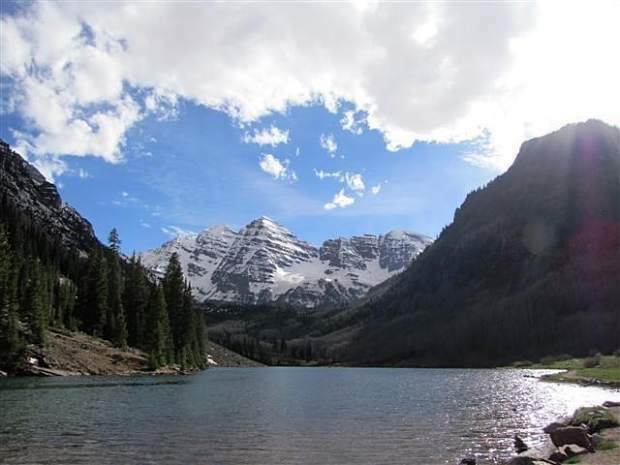 The lake is free of ice and snow, reported Peggy Jo Trish, Maroon Bells manager for the U.S. Forest Service’s Aspen-Sopris Ranger District. Anyone contemplating a hike beyond Maroon Lake, though, should be prepared: The hike to Crater Lake and beyond is snowed in. “You’re going to be stuck at the end of Maroon Lake,” Trish said. Silver Bell Campground, one of three Forest Service campgrounds off Maroon Creek Road, is clear of snow and also will open for the season Tuesday. The other two, Silver Bar and Silver Queen, will open May 24. The road is clear of snow to the parking lot at the lake and is getting plenty of early-season use by bicyclists and pedestrians, though vehicles will be blocked by the entrance station’s gate until Tuesday morning, Trish said. The opening of the Bells typically is timed to coincide with another Aspen ritual — the opening of Highway 82 over Independence Pass — tentatively scheduled for 2 p.m. May 23. Conditions this spring allow for the earlier opening at the Bells, said Martha Moran, recreation supervisor for the Aspen-Sopris Ranger District. Other key dates for Bells visitors to keep in mind: The entrance station opens for the season May 25, and motorists will be charged $10 per vehicle between 9 a.m. and 5 p.m. for a trip up to Maroon Lake. The $10 pass is good for five days. Bus service from Aspen Highlands to Maroon Lake begins June 15 and continues through Sept. 10; vehicle access to the Bells is restricted while the buses are running, from 9 to 5 p.m. daily. Motorists will be charged $10 per vehicle between 7 and 9 a.m. and from 5 to 7 p.m.
From Sept. 6 to Oct. 6, buses will run Fridays, Saturdays and Sundays only. For camping enthusiasts, Difficult Campground just east of Aspen opens for the season today, joining a handful of area campgrounds already open, including Ruedi Marina, Elk Wallow and Avalanche. Crews recently completed removing berry-producing shrubs and some of the shrub cover between campsites at Difficult, where bears have been an issue in past seasons. In one instance, a bear sat on an occupied tent while it munched on serviceberries from a bush overhanging the tent, according to the Forest Service. The campground is in prime bear habitat, according to wildlife officials, and it has been the focus of efforts by the Forest Service to prevent conflicts between bears and humans. “We’re trying to cut out the food supply in that area,” Moran said. This season will mark the end of a multiyear process to supply each campsite at Difficult with a “bear box” — a container where campers can secure their food, according to Moran. In addition, Redstone Campground will see its first bear-box installations this season, and more will be added at Chapman Campground in the upper Fryingpan, she said. Most other area campgrounds will be open by May 23, just before Memorial Day weekend, though Lost Man Campground on Independence Pass isn’t scheduled to open until mid-June, giving the snow time to melt. Go to http://www.recreation.gov for campground information and to reserve sites. Also opening for Memorial Day weekend will be the Silver Queen Gondola on Aspen Mountain. It will run May 25 to 27, June 1 and 2 and June 8 and 9 and then from 9 a.m. to 4 p.m. daily starting June 15, with the last ride down at 4:30 p.m. The Elk Camp Gondola at Snowmass starts operation June 22, running from 10 a.m. to 4 p.m. with the last ride down at 4:30 p.m.
A one-day, walk-up adult pass to ride either gondola is $28, but a $5 discount is available with an advance reservation, according to Aspen Skiing Co.